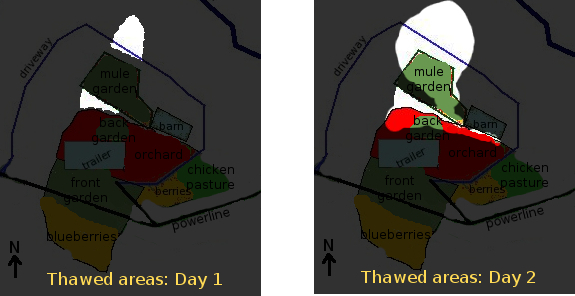 After over four years gardening on the same two acres of vegetables, orchard, and chicken pasture, I'm constantly surprised at how little I know about the yard's microclimates. 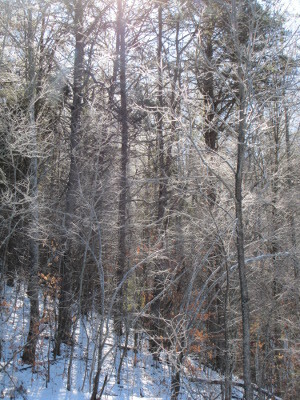 As Eliza pointed out on her blog, snow-melt is a perfect time to get those microclimates pertaining to sun figured out --- sunny spots will be the first to melt while shady spots will keep their snow for hours or days longer. Our accumulated December snow took days to melt (tiny bits of it are still out there), so I had a perfect opportunity to scope out sunny spots day by day. 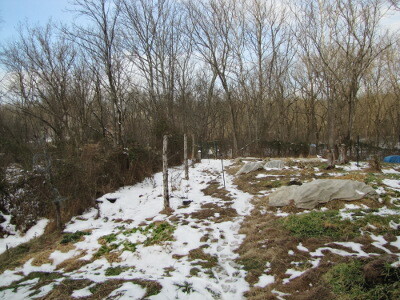 We live in pretty much the worst place for gardening in the winter --- on a north-facing slope on the north side of a hill. As the sun sinks lower into the sky during the colder months, more and more of the area up against the hill remains in shadow, and I look with longing at our neighbor's hay field, across the creek and far enough from the hill that frost on the field melts hours before it does in our garden. So I was a bit surprised to realize that a gap in the hills made an area just beyond the mule garden melt off even before my neighbor's field did. 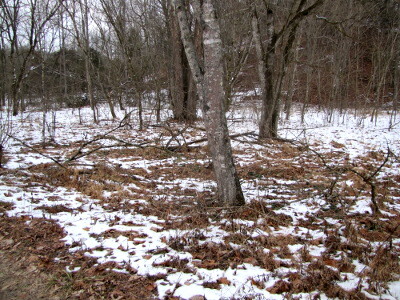 Doesn't this look like the absolutely perfect spot for a winter forest pasture? Can't you just imagine how happy our flock would be, scratching through these leaves, when their current pasture is still socked in under three inches of snow and ice? Moving back toward our main yard, I realized that we had another abnormally sunny spot --- the south-facing side of the gully that divides our mule garden from our back garden. Seeing the bare soil on this sheer south face while everything around it was covered with snow made me realize that I'm leaving a lot of sun on the table by letting this spot grow up in weeds. Maybe we should put Mark's hobbit cave here (assuming we could deal with drainage since the bottom of the gully stays good and damp.) Or perhaps this would be a good spot to terrace and plant sun-loving something-or-other halfway up the south face? If we went to all of the work of building a stone wall behind the terrace, I'll bet we could gain as much as two climate zones and plant just about anything we want there. And now for the bad news. 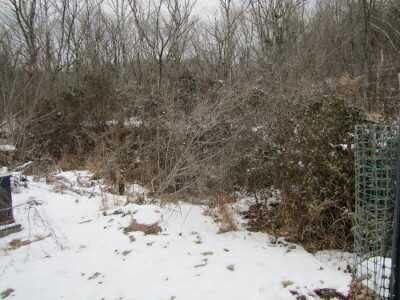 Since the gully has never been reclaimed (aka mowed), young trees, briars, and Japanese honeysuckle create a wall along the south side of the mule garden. Here, in our sunniest piece of flat ground, I'm wasting an eight foot strip of growing area along the southern edge due to deep shade from my briar bushes. We clearly need to find a way to get that gully under control so that the mule garden will work even better as our sunny winter garden spot. Our homemade chicken waterer keeps our flock well hydrated wherever they roam. Your description of the darkness of that north slope does not sound appealing (mental note for if I ever fulfill my dream of buying more property). I'm really glad you found some microclimates -- I'm sure your livestock would be delighted to have the pasture you described! Hills definitely have pluses and minuses. For example, we never get anything heavier than a stiff breeze here, even when people in more exposed locations lose their roofs to gales. And we can plant northern species like gooseberries up against the hill where temperatures are cooler. I tend to think that as long as you know your microclimates really, really well, there's a spot for everything.